The MV Rachel Corrie is steaming across the Mediterranean toward Gaza, flying the flag of Ireland, loaded with humanitarian supplies, and posing another impossible dilemma for the government of Israel. The activists onboard expect to reach Gaza by late Friday. The government of Ireland appealed for Israel to exercise restraint and urged it to allow the MV Rachel Corrie, whose crew includes five Irish citizens, safe passage to discharge its cargo. One of the main sources of IRA arms in the 1970s was Libya The first Libyan arms donation to the IRA occurred in 1972–1973, following visits by IRA Chief of Staff Joe Cahill to Libya. Cahill was arrested on board the vessel Claudia on 28 March 1973 in Irish territorial waters. The Claudia was found to be laden with five tones of Libyan arms and ammunition. In the 1980s, the IRA secured larger quantities of weapons and explosives from Qaddafi's Libya — enough to supply at least two infantry battalions. The bulk of the material in IRA arsenals was shipped from Libya with the aid of a skipper, Adrian Hopkins, hired by the IRA. On 1 November 1987, during transit to Ireland, one third of the total Libyan arms consignment was intercepted by Irish and French authorities aboard the MV Eksund. The vessel was found to contain 120 tones of weapons, including HMGs, 36 RPGs, 1000 detonators, 20 SAMs, Semtex plastic explosive and 1,000,000 rounds of ammunition. There were shipments before the Eksund which were not intercepted however. Small stocks were stored within Northern Ireland for immediate use. However, the bulk of the bigger arms reserves according to specialized sources were more likely stored in dumps deeper within the Irish Republic. The political deal which aimed to form the lasting settlement of the Northern Ireland conflict following the 1994 paramilitary ceasefires, known as the Good Friday Agreement, was signed in April 1998. However, the IRA decommissioned its arms only in July–September 2005. In an interview of the Sunday Tribune with a leader of the new Real IRA in February 2008, he stated that his break-away organization "has added to its arsenal since 1997." Indeed, it was reported in the past that IRA defectors are trying to track down guns and explosives hidden by the IRA in Scotland and security sources feared that the "forgotten" IRA dumps in central and south-west Scotland could fuel a new wave of attacks. Indeed, since March 2009, after the gunning down of a group of British soldiers, the number and gravity of Real IRA attacks is increasing, but there is no place here for an in-depth analysis of this phenomenon. Why this seemingly unrelated historic introduction? We only hope that remembering their own history, the Irish and British public and leaders will better understand Israel's problems and challenges ahead. In an op-ed published on June 1, 2010 in Jerusalem Post, I stressed that Hamas' ultimate goal is to arm itself with long range missiles and other heavy weapons in order to be able to attack again Israel, on the example of Hezbollah. I also stressed that in spite of Security Council resolution 1701, Hezbollah has not disarmed at all; it has rearmed itself with more than 40,000 missiles and rockets provided by Iran and Syria. 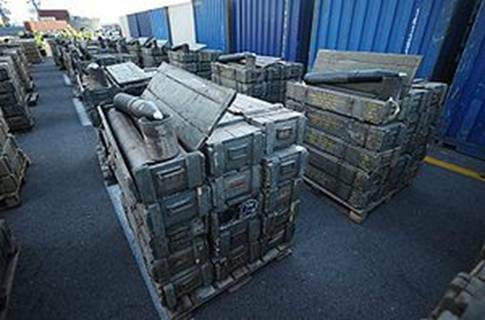 Unfortunately, the German Navy and lately the EUROMARFOR - a force made up of ships from Portugal, Spain, Italy and France – did not carry out their UN task of preventing the smuggling of illegal armament shipments to Hezbollah. Israel can present to the international community the challenges Israel faces, if this community is really ready and interested at all to see, to hear, and understand. Here are only three examples of this threat. The Lebanese Santorini weapons smuggling ship was intercepted by Israeli naval forces on May 7, 2001. The ship destined for Gaza and apprehended in the Mediterranean Sea, contained anti-aircraft missiles, anti-tank missile-launchers, RPG rockets, mortar shells, mines, rifles and guns. 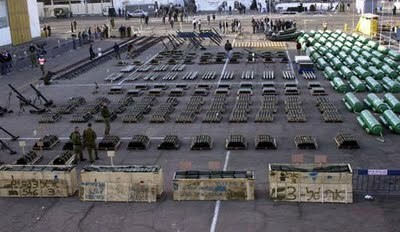 The shipment, some of which originated in Iran had been loaded in Lebanon by the Popular Front for the Liberation of Palestine – General Command. Prior to its capture by the Israel Navy, the Santorini - one of two arms-smuggling vessels stopped by Israel since the start of the intifada - made three successful trips. The first voyage, directed by Ahmed Jibril’s Popular Front for the Liberation of Palestine-General Command (PFLP-GC), was from Tripoli in November 2000. Its second and third voyages, both in April 2001, were run by Hezbollah, and the fourth, failed attempt, again by the PFLP-GC. 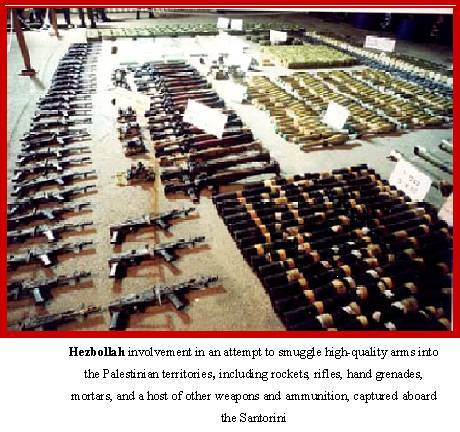 The arms cargoes in the "successful" trips were dropped along the Gaza coast and off Sinai, from where they could be smuggled into Palestinian territory through the tunnels on the Egypt-Gaza frontier. The Karin-A affair. At the height of the Second Intifada, the PA Chairman Yasser Arafat promoted a strategic agreement with Iran to enhance considerably the arsenal at his disposal in order to attack Israeli targets or to deter it to attack the Palestinian strongholds. 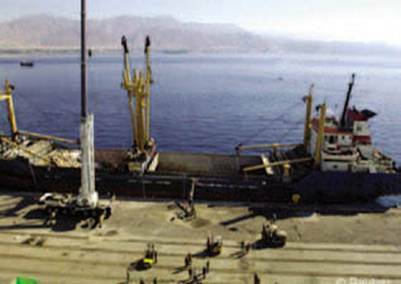 In January 2002 Israeli forces seized the Palestinian freighter Karine A in the Red Sea. The ship had loaded weapons at the Iranian island of Kish off the coast of Iran, then sailed through the Arabian Sea, the Gulf of Aden and the Red Sea. The vessel carried 50 tons of weapons, including 122 mm and 107 mm Katyusha rockets, antitank missiles, 120 mm mortar shells, and two and a half tons of high explosives. 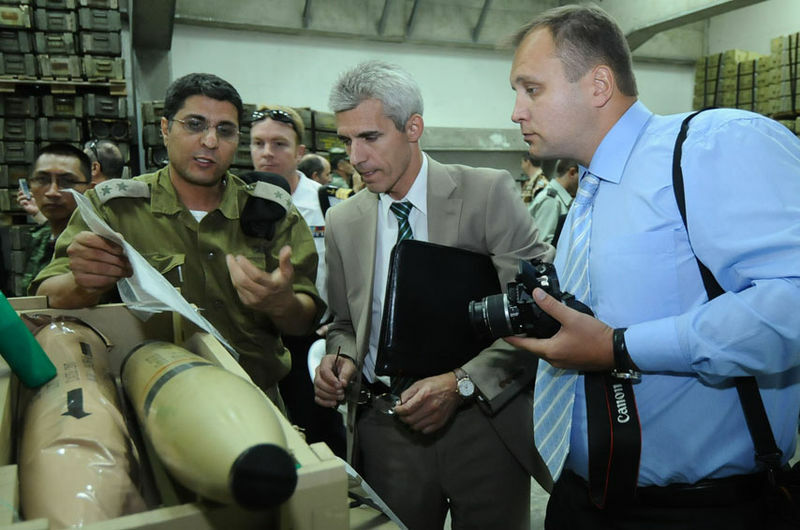 Ashkelon, the Ben-Gurion International Airport and various major Israeli cities would have been threatened by these Katyusha rockets if they reached Gaza. The shipment also included rubber boats and diving equipment which could have facilitated seaborne attacks from Gaza against the coastal cities. 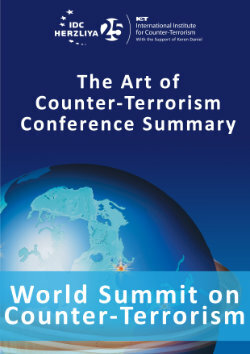 See more info about the affair at http://www.terrorism-info.org.il/malam_multimedia/English/eng_n/html/iran_e035.htm. The Karine-A seizure proved to the Israeli government and public, but also to the Bush administration at the time, that Arafat was not a real partner and practically sealed his career as the leader of the Palestinian Authority with which Israel could negotiate real peace. The Francop Affair was a high seas incident on November 4, 2009 in which the Israeli Navy seized the MV Francop cargo ship in the eastern Mediterranean Sea and its cargo of hundreds of tons of weapons bound from Iran to Hezbollah. More than 3,000 medium-range 107- and 122-millimeter rockets, armor-piercing artillery, hand grenades and ammunition for Kalashnikov rifles were smuggled aboard the ship. The rockets that were seized are the equivalent of about 10 percent of Hezbollah's existing stock, and could have been used for weeks of intensive shelling of northern Israel. 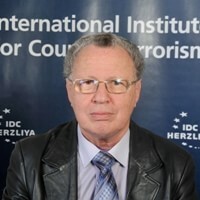 It is clear from the past experience and reality that the blockade of the Gaza Strip, which was used by Hamas as platform for rocket, through border and suicide attacks since the first day it took control of Gaza after the Israeli unilateral withdrawal, is not a whimsical decision of this or other government of Israel. The problem is not with the Turkish IHH organized flotilla or with the MV Rachel Corrie and the humanitarian aid they carry. The conditions of the blockade could and should be revised in order to permit the Gaza population an honorable standard of living. The real problem is that the opening of a free sea lane to the harbor of Gaza means a huge and rapid rearmament of Hamas and other radical groups, including those "salafists" pretending to be associated with al-Qaeda (which inter-alia flourished only since Hamas came to power). In practical strategic terms it means that there will be no incentive for Hamas to achieve an agreement with the Palestinian Authority on a common moderate platform which could lead to peace negotiations with Israel. It means Iran, Syria and Hezbollah will have more and more leverage upon Hamas's strategy and in the end it will lead to war. But that war will be much more ferocious than the Cast Lead operation and will compel Israel to reoccupy the entire Strip, with the dire consequences nobody would like to face.